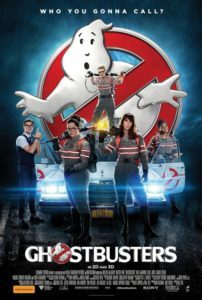 Non-believer Erin (Kristen Wiig) joins believers Abby (Melissa McCarthy) and Julian (Kate McKinnon), and streetwise Patty (Leslie Jones) to form a current day foursome dedicated to bustin’ all things paranormal. Obviously the plot is new (not really) but this remake keeps rounding back to the 1985 classic, with the direct references to that film being the only thing that keep me awake. But callbacks and cameos can’t be your framework for entertainment (were four versions of the Ray Parker Jr song necessary?) we have conventions for that sort of thing. Bring something new to the table beyond a beyond a gender switch and more slime than the Nickelodeon Kid’s Choice awards. Give one of the ghostbusters a decent joke to deliver. Give them a character trait beyond the one line descriptors; awkward, sincere, sassy, funky. And for Ghost’s sake give (Freddy?) Hemsworth’s receptionist character something to do beyond being mindless. This is all very shiny and expensive looking, like an empty vase. But the question remains: Who you gonna care? Nobody! Poor syntax aside, it shouldn’t be killing Bambi to lament just how dull Ghostbusters 2016 turned out. Those defending the project by claiming nay-sayers are being sexist are either off the mark or engineering some weird reverse sexism of their own by demanding lower comedic standards for women. Final Rating – 5.5 / 10. This is an unfunny and unwanted reminiscence that is just plain busted. This new version was hilarious! The crowded theater was laughing out loud throughout the entire film. The acting was great, the special effects were great (much better than the original), and it was funny. It takes nothing away from the also-great original and keep an eye out for many famous cameos. You will love this version.